Columba was a great lover of books and it was perhaps his passion for them that established the monasteries as “publishers” (all painstakingly inscribed by hand, of course). Columba was born in Ireland, in 521 at Gartan, Co. Donegal, into the powerful Ui Neill clan. His mother, Eithne, was a princess from Leinster. Given the name “Crimhthann” (meaning “Fox”), at birth, he was later chris­tened Colm (or Colum or Columba), by his foster father Cruithnechan. That name meaning “Dove,” finally became Colm Cille due to the many “cells” or churches he founded. Columba was educated at Finnian’s famous school in Movilleand; studied at Leinster with the Bard Gemman (and became a poet himself); studied yet further at Clonard, even­tu­al­ly becoming a priest. He returned to Ulster a robust and handsome young man, with a voice that was said to be “so loud and melodious, it could be heard a mile off.” He spent the next 15 years trav­el­ling and founding monas­ter­ies, including the famous Derry, Durrow and Kells. Columba was a great lover of books and it was perhaps his passion for them that estab­lished the monas­ter­ies as “pub­lish­ers” (all painstak­ing­ly inscribed by hand, of course). It was also this passion that, by most accounts, got him into big trouble. Columba felt wronged. This resent­ment finally spilled over when Curnan of Connaught sought refuge with Columba and Diarmaid’s men defied the laws of sanctuary and murdered Curnan in the church. His outrage spread to his clan, resulting in a bloody battle in which thousands were killed. The “Dove” was held respon­si­ble for their deaths and would have been excom­mu­ni­cat­ed but for the inter­ven­tion of St. Brendan. In atonement, Columba vowed to convert as many persons as had died in battle. There are several versions of his reason for leaving Ireland, but by most accounts, he departed with 12 disciples in a leather coracle (much like Brendan’s) and travelled north to the isle of I or Hy (Iona). There he estab­lished a monastery which, in spite of its austerity, became a center of culture and con­ver­sion. 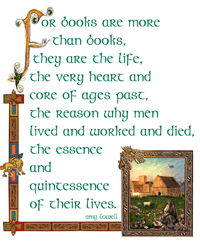 People of all ranks, from all over Europe sought Colmcille’s wisdom, prophe­cies and miracles. One fable maintains that he drove a great monster from the River Ness out into the Loch where it could do no harm. Four Scottish kings bore the name “Malcolm” (Malcolumb), meaning a devotée of St. Columba. Colmcille lived on Iona until his death at age 76, and appears to have mellowed in his old age. One nice legend holds that, as Columba sat down to rest, a white horse approached, nuzzled him and shed a tear, thereby letting Columba know his time on earth was coming to an end. It is a fitting tribute that the earliest existing example of a Celtic illu­mi­nat­ed man­u­script is the Cathach of St. Columba — written in his own hand. The mag­nif­i­cent Book of Kells was produced at Iona and the brilliant Book of Durrow was created at another of his monas­ter­ies. We’ve provided a few links above to infor­ma­tive sites. If you know of any that should be included, please contact us using the form below. Just click on the image at left to view/​print a free “Connections Quotation” pdf. Our St. Columba is available in a number of media, including art-to-wear and greeting cards. Please visit PatriArts Gallery to view them.